Wondering about the lack of updates recently? I must confess, I haven’t been packing bentos lately. Whereas I used to prepare an obento at an average of 3 out of 5 working days in a week, I’m down to none. Blame it on the inability to sleep early and the desire to stay in bed. Still, one thing I’ve forgotten about preparing bento is how it invigorates me in the morning. That extra 30 minutes spent in the kitchen starts my day on a high note. Something that I rediscovered as I was putting together lunch this morning. While I didn’t really cook this morning—it was just a matter of steaming and slicing stuff, I still found it as invigorating as preparing a bento from scratch. I guess it’s really the mental challenge and the hustle and bustle that gets me pumped up. Yes, for me, preparing a bento is a mental challenge, because I have to plan, visualize and adjust what goes on in my lunch box. Take this bento for instance. I knew I wanted to pack yesterday’s leftover Asado Siopao (steamed pork buns). From there, I planned what to include (Hmmm, what will go well with siopao? ), how much space it will take up, and what else do I include to balance the whole thing. In this case, I sliced a couple of Century Eggs, steamed some gobo maki—a chikuwa-like fishcake roll that’s stuffed with gobo (burdock root), and threw in a couple of kiat-kiat. Not as colorful or well-balanced as I’d like but it works, not only as a packed lunch, but as an excellent picker-upper for the morning. Mmmm, siopao. Now I know what to eat for lunch. That smiling siopao is so adorable! It’ll perk up whoever opens that lunch box of yours. Those are eggs?! How’d they change color like that? What do they taste like? Hi Ziggy! Sorry for the late reply. Those are century eggs. They’re a Chinese delicacy—they’re basically eggs that preserved in a mix of —I’m not quite sure, lime and stuff I think— for a hundred days. It’s an acquired taste but good quality century eggs make for great, contrasting flavors and textures. I love this bento. I gave me the idea to make mine much more simple. This bento is just a few very good thing that make a great impact. It made me smile. I too find it a great way to start my day, The only reason I get out of bed early is to make lunches for my family. Thanks for sharing. Jessica Odling. Please contact Animal Care Clinic in Corsicana Texas about a dog….lost and microchipped…registered to you. Chihuahua with underbite. 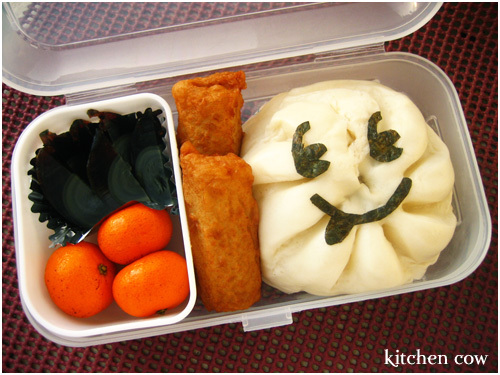 I’ve never even thought of using siopao for a bento! I like this, simple and fast. Where do you buy your Japanese ingredients? Thanks Suzanne! As to shopping for Japanese ingredients, I usually hit the local supermarkets like Makati Supermarket Alabang and South, plus various Japanese groceries like Hatchin, Yamazaki, and Co-op. I guess in an area where there are a lot of Japanese expats, it’s easy to find imported Japanese ingredients.